The somewhat self-absorbed reflections of an aspiring long distance athlete. The last couple of years I had piled on the weight in the lead up to Xmas before knuckling down and losing 2 ½ St or so before the big running events of the year were scheduled. Alas, this year it hadn’t worked out that way as I had stalled at less than 1 ½ St loss. After bending the entry criteria to get into the the Yorkshire 3 Peaks Fell Race I was at the back of the field within a mile and ½ mile behind the next last runner by mile 2. Nearly 1000 people disappeared without trace ! 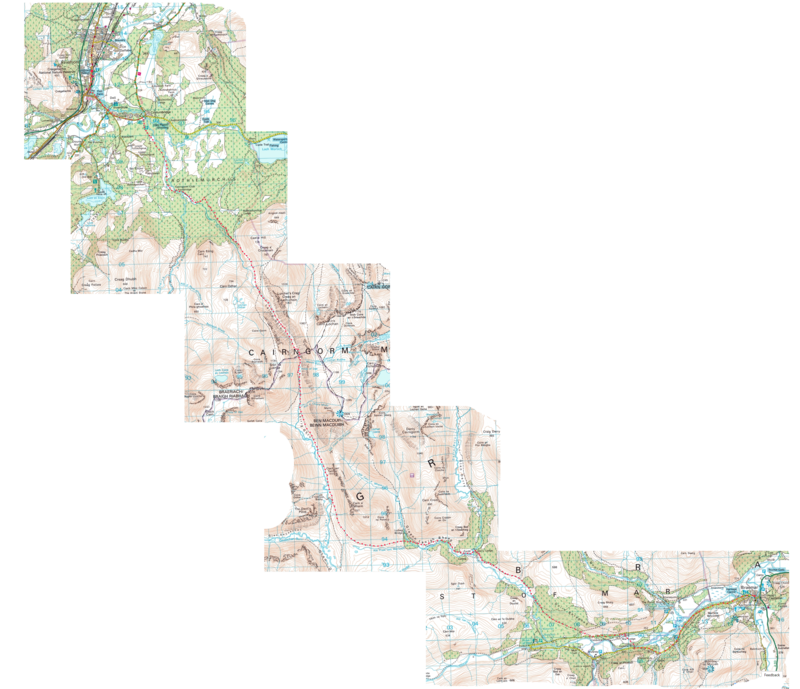 An ignominious end as I quit after coming down off Penyghent without even making the first checkpoint. 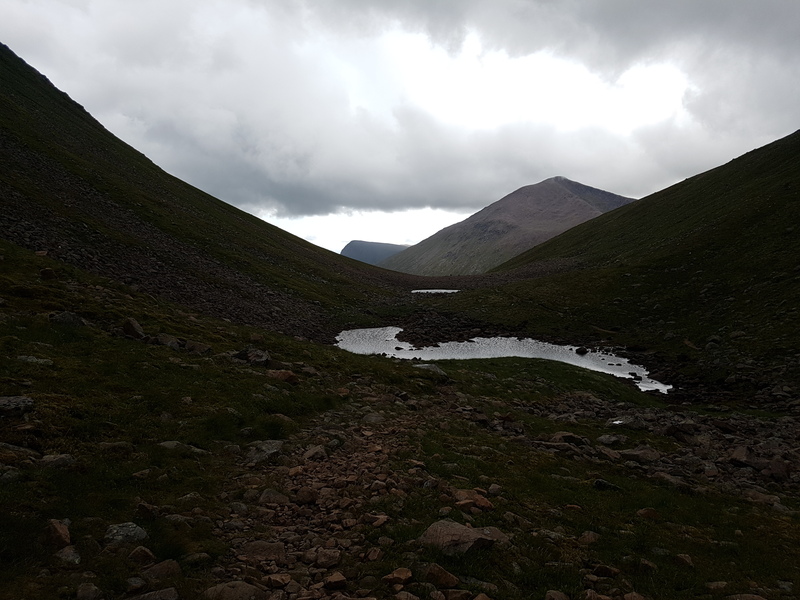 At the same time as signing up to the Yorkshire 3 Peaks I had also entered another fell race, The Lairig Ghru. This was a race that had instantly captured my imagination when I read about it a few years ago. Why ? 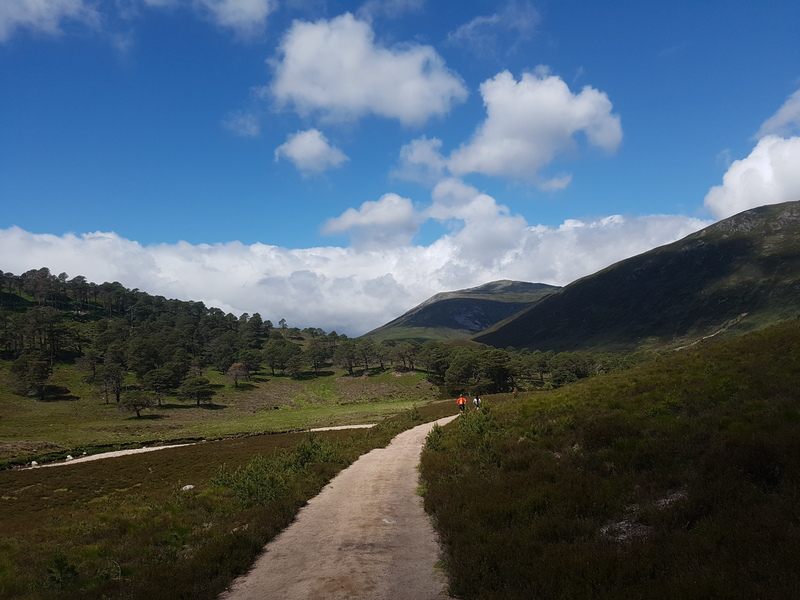 It’s simply that the route through the centre of the Cairngorm Mountains between the towns of Braemar and Aviemore is absolutely iconic with the nearly 27 mile route heading over a pass at 2740 ft with the shortest distance by road nearly 2 ½ times as long. 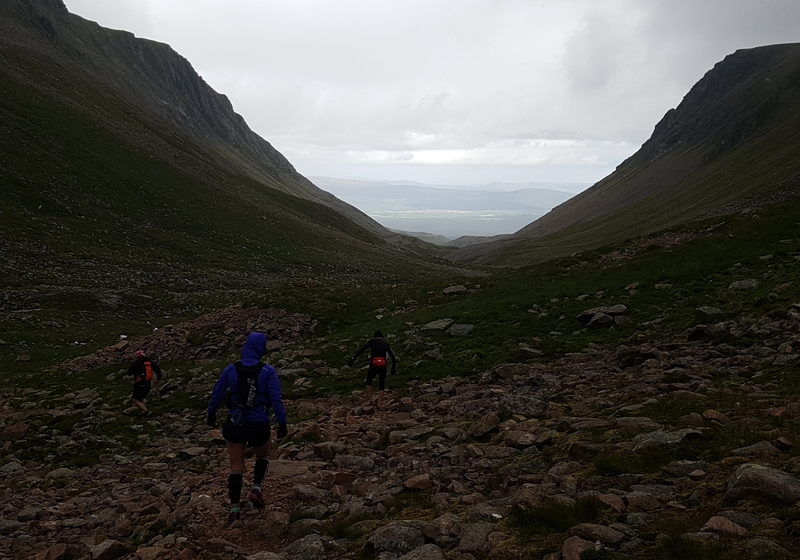 The key to success at this was beating the cut-off at Derry Lodge approximately 9 miles into the race with a time limit of 1 ½ hrs. 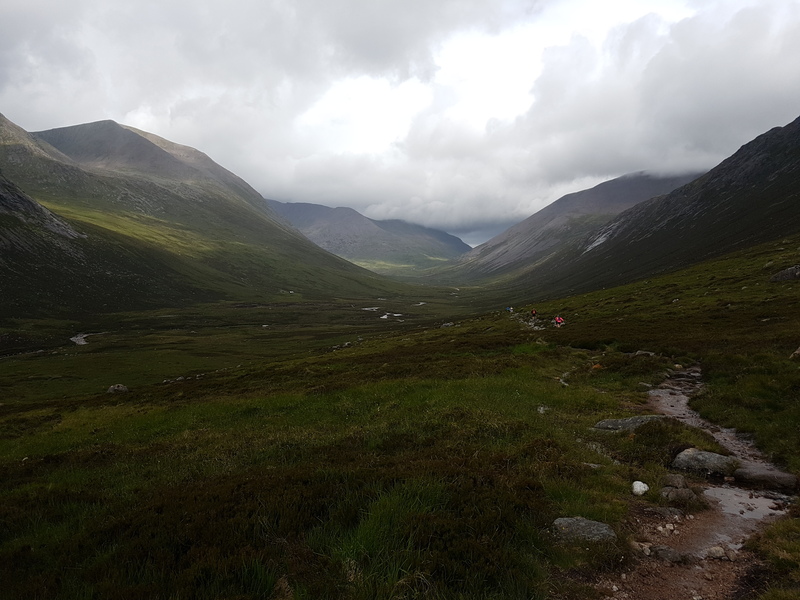 I was nervous about this as I would have to run at (my) top speed and it was clear from looking at the map that there was a bit of an incline leading up from Mar Lodge onto the hillside before the path dropped back down into Glen Lui. So the aim was to run as hard as I could and beat the cut-off. Anything else was a bonus. After a bit of a delay from the scheduled start at 10.00am caused by the RD calling every runner (c. 400) forward to the start individually (no idea why he did this) we were away and having positioned myself near the back and being rapidly overtaken by all around me I made the mistake of looking behind after about a mile to see 3 runners in red jersey’s pacing out methodically about 50 yards behind. Oh god it’s just me and then the sweeper runners ! I pushed on and from my GPS watch I could see that I was managing a pace of just over 9 minute miles which was just within a pace that would keep me inside the cut-off. 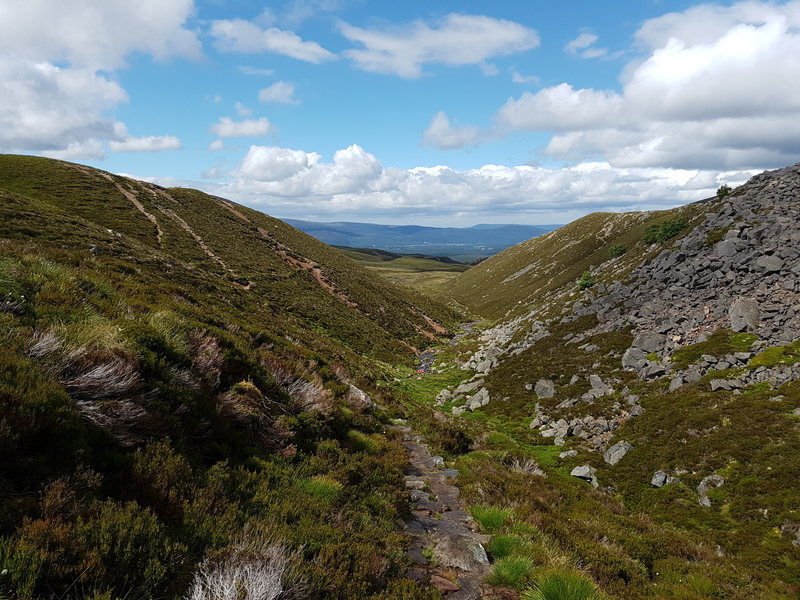 After a couple of small rises on the way out of Braemar there was a long downhill down to Victoria bridge where I relished the cushioning of my newly purchased Hoka Mafate Speed 2 shoes. I knew that I was very fortunate in that it was a chilly 13 degrees with a stiff wind blowing into my face. The number one issue with running when overweight is not the fact of the extra weight itself but the fact that you overheat far more easily to the extent that one’s running slows to a crawl or even gives way to walking as it had during the Edinburgh marathon the month before. 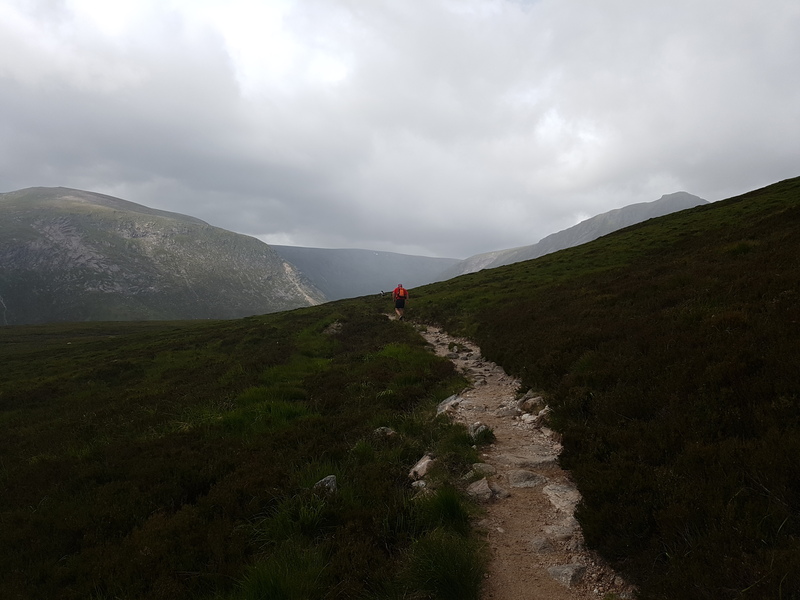 As I walked up the steep bit of track from Mar Lodge I spotted another runner who was also walking and who I had clocked as being about the only other person apart from me who was carrying a bit of extra weight. As the track levelled out he continued to walk whilst I broke into a run and soon I was past. Hooray I’m not last any more. 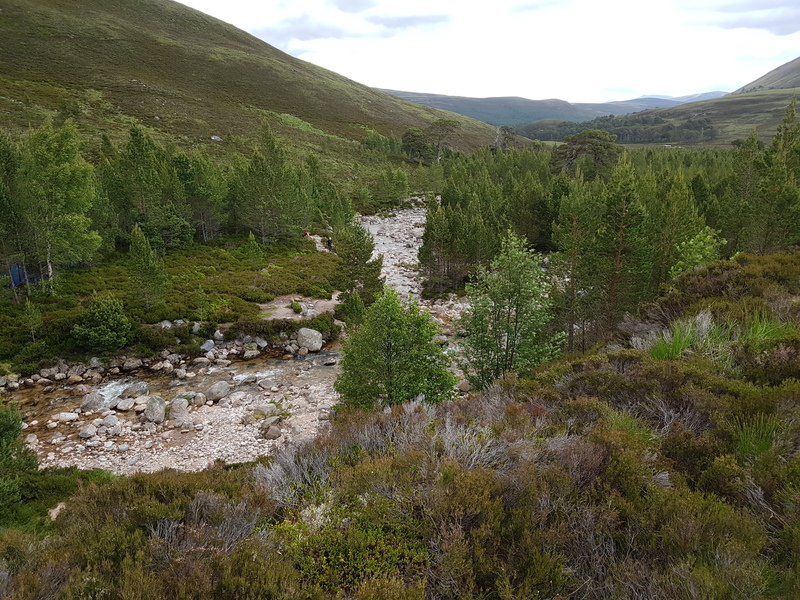 As the track dropped into Glen Lui I could see the trees at the head of the valley, within which Derry Lodge was located. I was still keeping to time and it all seemed good. The only thing was how far into the trees was the lodge ? I had read on someone’s blog it was c.14km and I prayed that was the case as even 14.5km might see me fail to make it through the cut-offs. I got nearer the trees and just after entering I saw a boarded up building, is that the lodge I wondered, looks a bit small for a lodge, though a bit big for a gatehouse ? I came past it still unsure until around the corner I saw the Landrover and the Marshalls of the first checkpoint. Yabadabadoo I had made it 1 hr 23mins with my GPS watch showing 8.47 miles well under 14km. Absolutely chuffed to bits, I could relax, take my time and just be a total tourist. The sun came out and Iooking around the setting was absolutely stunning. Time for some photos and then off I walked, dawdling across the valley floor. Soon the person I had overtaken came past and I decided I really needed to do some running to keep up, it was after all a fell race ! Wonderfully scenic, note the other heavy runner ahead ! It was all incredibly scenic and very easy flat running as I approached the crossing over the Luibeg burn. From seemingly out of nowhere 5 or 6 more runners appeared behind me, including 3 girls in red skirts running together Maybe that’s who I saw behind me when I thought it was the sweepers I thought. The path climbed and soon it began to rain. I stopped to put on my jacket and as I got going again a chap came past and said Are you a walker, then seeing the number attached to my shorts, oh your’re a runner I’d better stay behind you then. Damn. Pride now meant that I needed to stay at least on the heels of the last but one runner and I consoled myself that there was no doubt I needed the training. 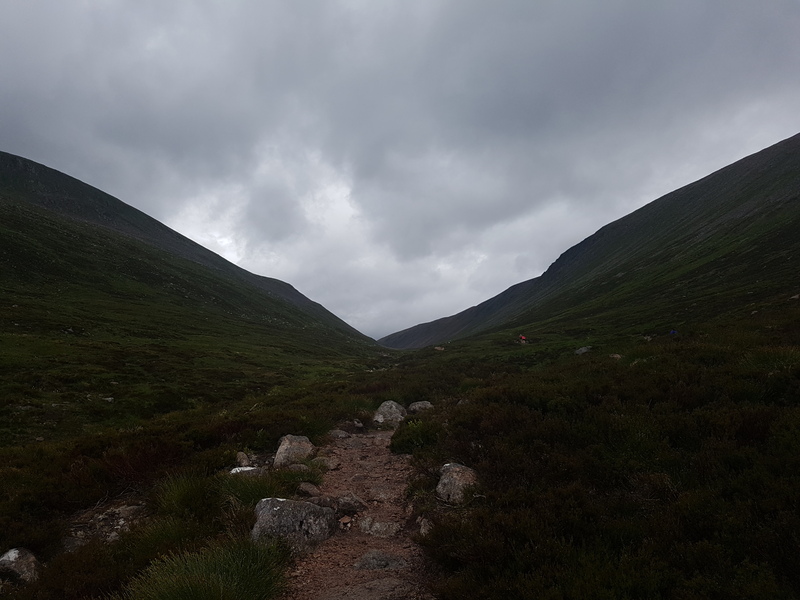 The path undulated and then dropped down into the Lairig Ghru past Devil’s Point before rising more steeply up through the Pools of Dee and the boulder field. It was now driving rain and a howling wind and I started to get really cold another reason for keeping going as best I could. 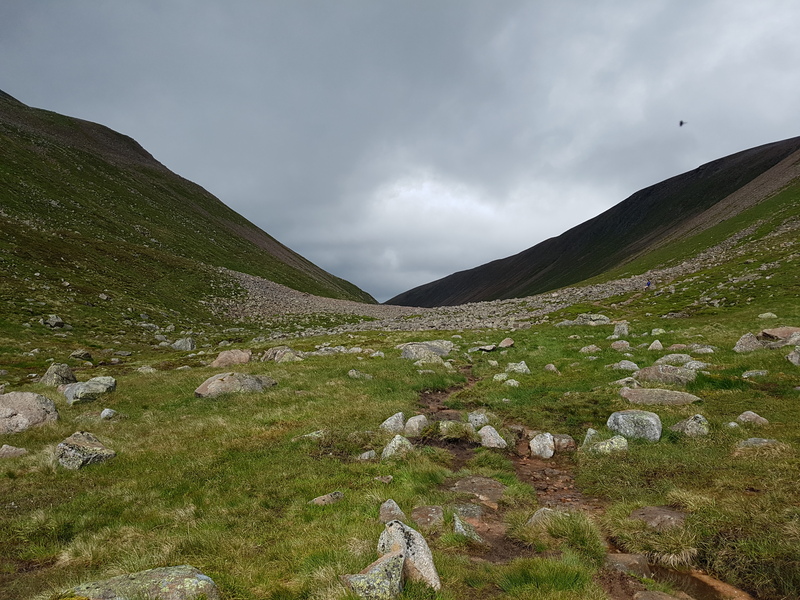 The boulder field itself turned out to be far less daunting than I had anticipated. It was really quite easy and there were often paths that skirted the worst of it. 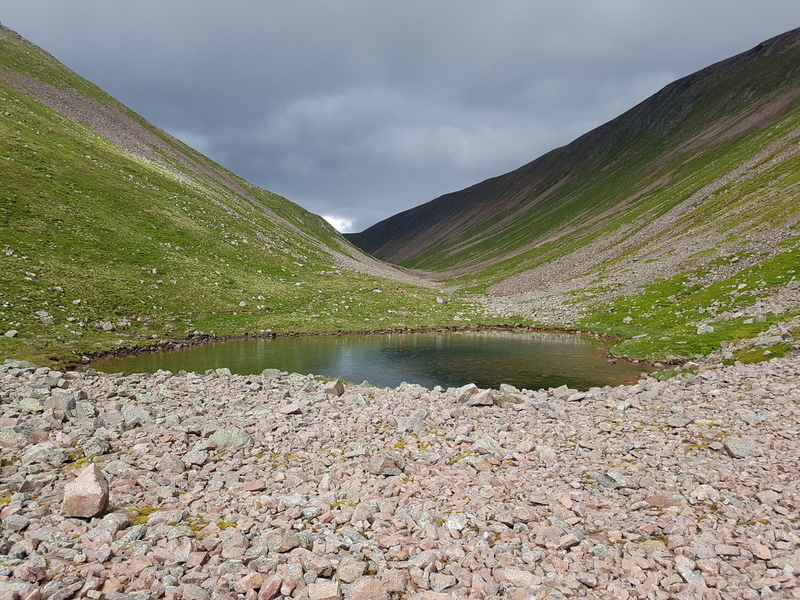 I realised in retrospect that one of the images I had seen on the web when searching on Lairig Ghru had actually been of the Charlamain Gap a narrow defile enroute to the pass where the boulders were massive and there was no choice but to climb through the middle of them. I was still keen to take photos, though I couldn’t help feeling inhibited over how long I took as the sweeper runner clearly was there to shepherd the last runner towards the finish rather than hang about while they took photos ! 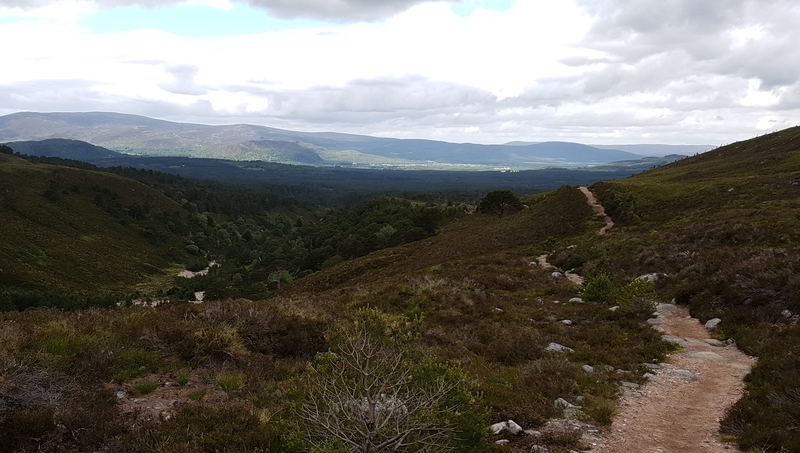 At bang on 17 miles we hit the top of the pass and I could see Aviemore far away in the distance. Woohoo, all downhill from here. The path though was narrow and rocky and I was too tired to muster the nimble mountain goat technique that is needed on this sort of technical trail. 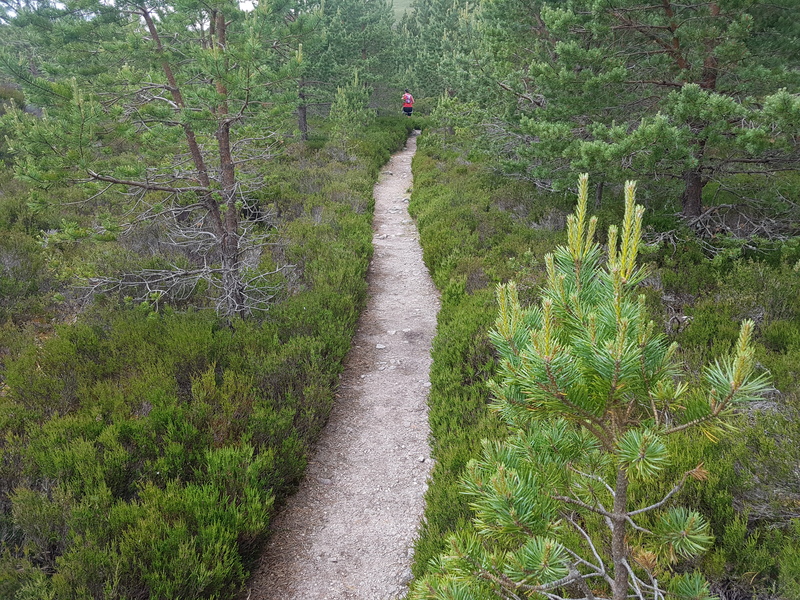 As it got lower the path slowly improved and then it was a gentle cruise downhill eventually entering the forest of Rothiemurchus. This was stunningly beautiful and not at all the “flog through the forest” that I had read in someone’s account of the race. 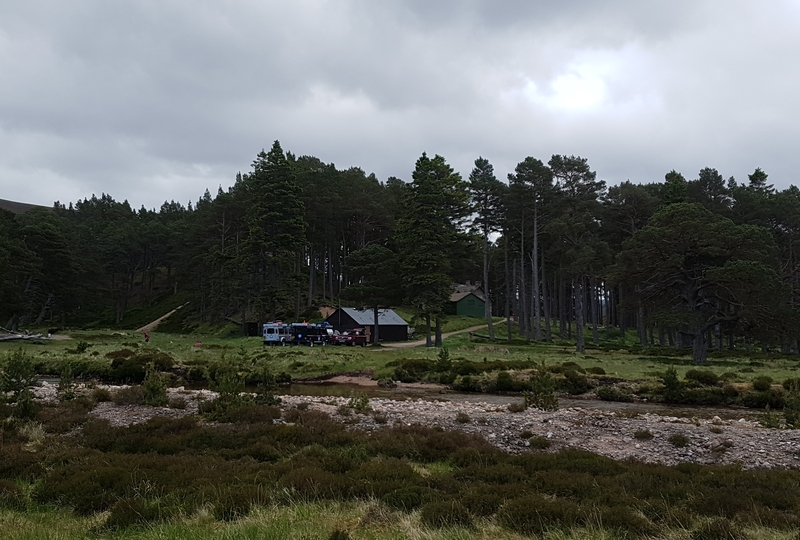 Indeed this was Scottish Highland pine forest and couldn’t have been more different to the Conifer Plantations of Northern England that I was used to. It was now a matter of pushing on and keeping the walking breaks to a minimum. Before too long I was heading up the main street of Aviemore in the rain and the finish to be followed 10 minutes or so later by the sweeper and the other heavy lad.